Colombian President Juan Manuel Santos has said that he wants to enter into a bilateral truce with the Farc rebel group on 1 January 2016. Despite having been engaged in peace talks with the left-wing rebels for almost three years, the government had always refused to declare a ceasefire. The Farc, who have been observing a unilateral ceasefire, have repeatedly called on the government to join them in the truce. The conflict started in 1964. Speaking at a public event promoting science, Mr Santos called on the Farc and government negotiators "to make the effort so between now and 31 December we can wrap up the fifth point [on the peace agenda], which is how to end the conflict, so that we can declare an internationally monitored bilateral ceasefire from 1 January". Mr Santos had in the past refused to enter into a bilateral ceasefire with the rebels arguing that during previous negotiations, the Farc had used it to re-arm and re-group. An estimated 220,000 people have been killed in the 51-year armed conflict, the longest-running in the Western Hemisphere. Farc and the government negotiators started official peace talks in the Cuban capital, Havana, in November 2012. Since then, they have reached agreement on the political participation of the rebels, land rights, drug trafficking, and most recently, transitional justice. Transitional justice - how rebels who have committed crimes will be punished - had been considered one of the thorniest issues on the agenda. 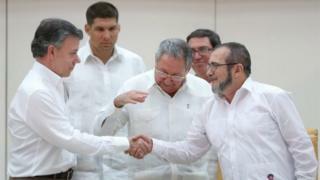 When the two sides announced a deal on the issue on 23 September, President Santos flew to Cuba and shook hands with the Farc leader known as Timochenko. The president also set a deadline of six months, until 23 March 2016, for the signing of a final peace agreement.